Kaanapali Trail guide Thadd Camara conducts a tour portion aboard the trolley. Kaanapali Beach Resort has introduced a new, free tour highlighting the area's history and legends. The 90-minute "Kaanapali Historical Trail" tour takes place 9 to 10:45 a.m. every Tuesday and Friday, starting at the north end of Kaanapali, with stops at 10 sites. The guided tour starts at the Plantation Farm & Ancient Village of Kekaa at the Royal Lahaina Resort and continues south, taking visitors as far back in time as the 15th century, with stories about Chief Kakaalaneo and the legend of Puu Kekaa and Chief Kahekili. The tour ends at the Hyatt Regency Maui Resort & Spa. A minimum of five people is required for each tour, and there is a maximum of 22 people per tour. 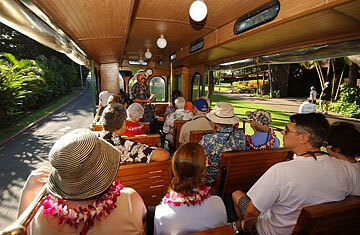 The Kaanapali Trolley takes guests to the first four sites of the tour, and the remaining sites are walked. Visitors can also take a self-guided tour of the trail using the colorful brochure and map available at the Kaanapali Beach Resort Association office at 2530 Kekaa Drive, Suite 1-B, Lahaina. Reservations are required and can be made by calling 808-661-3271. Check-in is at 8:45 a.m. at the Royal Hale across from the parking lot at the end of the Royal Lahaina Resort drive. Island Air is expanding its inter-island service with two new non-stop routes connecting Maui with Lanai and Kauai. Beginning April 2, Island Air will offer non-stop connections between Kahului, Maui and Lanai. Island Air decided to add the 20-minute flight to enhance travel options for residents of Lanai and offer Four Seasons Resorts guests a direct connection from Kahului. Effective June 1, Island Air will offer a non-stop flight between Lihue, Kauai and Kapalua, Maui. One-way tickets for both new routes start at $59. Travelers who book on Island Air's Web site will receive a 10 percent discount on all fares. Reservations for the two new routes are now being accepted. Lanai to Kahului: Flight 340 departs at 11:30 a.m., arrives at 11:50 a.m.
Kahului to Lanai: Flight 341 departs at 12:20 p.m., arrives at 12:40 p.m.
Lihue to Kapalua: Flight 524 departs at 11:45 a.m., arrives at 12:45 p.m.
Kapalua to Lihue: Flight 525 departs at 1:05 p.m., arrives at 2:05 p.m.
For reservations and information, visit www.islandair.com. In celebrating the month of love, Spa Moana at the Hyatt Regency Maui Resort and Spa in Kaanapali Resort, Maui, is featuring a new Chocolate Macadamia Nut Scrub, which will cover you in pure chocolate frosting blended with fine oils to leave your skin sexily smooth, pampered and exfoliated from top-to-bottom. The decadent 50-minute Valentine treatment will be available all month, for $155. For more information, contact spa director Josay Fernandes at (808) 667-4427. For spa reservations, call (808) 667-4725. Spa treatments are available from 8 a.m. to 6 p.m., and the salon is open from 9 a.m. to 6 p.m.